I have been dwelling on this bread for months. I'd never heard of wild yeast before reading The Bread Baker's Apprentice, and when I learned that I would have to create my own (?!?) I wasn' t sure what to expect. But I knew to be nervous. My little guy turned three on Friday. We planned a family party for Sunday. I like to keep things easy for these kinds of parties, so I just serve make-your-own sandwiches, fruits, veggies. That way I can put all of my energy into making an awesome cake, visiting with our family, and enjoying the day. I found an awesome train cake mold on clearance a couple of years ago. The little guy is a big fan of trains and baseball, and our ballpark (minor league . . . my dad has season tickets) sits right against railroad tracks so we watch the trains go by during all of the games. Thus the train with the baseball players in the center. So this year, to keep the stress-level low, I decided that instead of purchasing rolls, I should combine the birthday party with BBA Challenge #30 and make my first ever sourdough bread. You know, the one that's been making me nervous for the past several months. I also decided to make a double batch so that I could see which of my starters was a keeper and use up or discard the other one. Hm . . . I guess I need to work on stress-reducing choices. "Glad to hear your new pet is doing well! With that other 1 oz, feed as usual, let it rise for a couple of hours on the counter until it’s increased to almost double then get Mom back into the fridge, safe and away from the baking stuff. I might also recommend you do 1 oz of old starter and 2 oz of water + 2 oz of flour which gives you a feed ratio of 1:2:2, this gives your starter more food. This will then give you a 5 oz Mother Starter and 4 oz of excess to make bread with at each feed. And if it happens that you aren’t baking that week, you’ll be discarding just 2 oz of flour, not a big deal." Extremely helpful information. And I'm so glad I didn't try to figure out what to do on my own; I assumed I had to make a new barm, so I would've made myself go through several extra (and totally unnecessary) steps. I divided each starter into two on Friday evening: a batch to remain a mother starter in my fridge and a batch to become my Peter Reinhart-termed barm for my bread. They took all night to double. But once our thermostat kicked into "awake" mode this morning, they both rose right up. It worked; after another few hours, they doubled. I mixed for four minutes in the stand mixer, let the dough autolyse for fifteen minutes, and then kneaded by hand. The dough was really supple and smooth, just a little tacky, and very nice to work with! After a few minutes kneading by hand, I had a perfect temperature and a perfect windowpane. And then the wait . . . again, it took way longer than the suggested three to four hours to double. This post on The Fresh Loaf made me feel a lot better, assuring me that colder temperatures in the winter lead to seemingly-stalled starters and extremely long rise times. He also states that white flours rise more slowly, as do firmer doughs. So it seems I've hit just about every indication of really really slooooooow sourdough rises. At 1:00 in the morning, I woke up and sure enough, one of the containers of dough had almost doubled and was ready to be shaped. So I went downstairs and formed it into one twenty ounce boule and seven almost-four ounce rolls. They sat out for the rest of the night and were ready to bake this morning. This morning, I also realized that the other dough wouldn't be ready on time for my second batch of sourdough, so I quickly (love how quick this recipe is!) whipped up another batch of Mags' oatmeal bread and made it into rolls. While it was rising, I baked the sourdough. I baked the rolls first. I put them into a 500 df oven, turned it down to 450, covered them with a roasting pan for ten minutes (I love this new easy steaming technique! ), and then baked them for about another ten minutes. They had incredible oven spring after that first ten minutes! While the oven was going back up to 500, I slashed the boule; still not great, but way better than my slashes have looked the last few times. I slid it onto the baking stone, cooked it (with the lid on) for about ten minutes, and then uncovered it for the last 20 minutes of baking. I probably could have used the lid for a little longer; the boule didn't spring up as much. Still, they smelled and looked like sourdough! At the party, I quickly welcomed all of the guests and then got down to the important matters: slicing open the loaves, taking pictures, and taking a taste! The oatmeal bread (on the right) was fantastic. This is definitely the quick, easy, delicious multigrain bread that I have been searching for. I will make it for our weekly sandwich bread now, and I'd love to experiment with adding a few other grains. I'm not a huge sourdough fan, but the bread on the left is my pride and joy. I tried to explain to the hubby what it feels like . . . to make bread using yeast that I made is just the coolest thing ever. A fellow BBA Challenger over at Salt and Serenity called baking her first sourdough her bread bat mitzvah. I love the comparison! After you produce your first successful sourdough, you can finally proclaim, "Today, I am a bread baker!" Several guests at the party who are big sourdough fans said that this sourdough was great. I am excited to see the flavor develop as I continue to nurture my starter. And I am excited to bake the second batch and compare it with the first to decide which will be the keeper! On Wednesday, December 16, my life was forever changed. Well, not really, but on that day, I read fellow BBA Challenger Mags' post about making pizza buns and I knew they were in my family's future. I shared the post with the hubby, who started salivating on the spot. And then I got caught up in the rest of the Challenge and promptly forgot about them . . . until yesterday. Did Peter Reinhart foresee Nicole's Challenge? I couldn't believe it when I read ahead from the potato rosemary (and garlic!) bread and realized that the next bread used exactly the amount of biga left over (11 ounces) and 2 ounces of my leftover mashed potatoes! It was like fate! We were meant to bake these two breads within days of each other. But I still had a bunch of potato rosemary bread that we were working our way through, and we didn't really need two more loaves. Oh, I know I could've given them away, but then I suddenly remembered Mags' post! So yesterday afternoon, I took my biga out of the fridge to let it warm up to room temperature (and then took a nap, but I guess that's not really pertinent). I couldn't find the fancy durum flour that's traditional for this bread, so I used some semolina (about 2 1/2 ounces) and then bread flour for the rest. I mixed the flours with the biga, salt, yeast, leftover potatoes, and the minimum amount of water. Peter Reinhart warns that it's a sticky dough, so I used my stand mixer. I had to add some more water to get the dough more sticky, and I'm guessing I still could've used more. I found that the dough picked up a lot of flour from the stretch-and-fold and wasn't nearly as sticky by the end; probably why my finished product didn't have any big holes. Right as I finished mixing and was about to start the stretch and fold process, I discovered that we were going to take an unexpected fieldtrip to my dad's house. So I got a baking sheet, put the cutting board with my dough on it (covered with plastic wrap), grabbed my flour, oil spritzer, and timer, and headed out the door. I finished the stretch-and-folds at my dad's and had to borrow a bowl. You can see how the dough really firmed up (although I hadn't thought to bring my camera, so I had to use the hubby's cell phone). Mags' recipe (which she adapted from this recipe from the King Arthur Flour's web blog) only called for 1 1/2 pounds of dough and Peter Reinhart's recipe made 2 pounds of dough, so I decided to make a mini (1/2 pound) loaf with the rest of the dough. I formed this one into a boule, put it in an improvised banneton (a mixing bowl with a cloth in it), and let it rise for almost two hours (it was only supposed to rise for 60 - 90 minutes, but we had a lengthy bedtime last night). I then baked it with my adapted-hearth baking method (covered with a roasting pan for the first 10 minutes) and then for an additional 5 minutes, until it was at a perfect 205 df in the center. As I said earlier, no big holes at all, but the taste was fantastic. The loaf was gone within 30 minutes of first slicing it. I will definitely be baking this bread (as a bread) again. I flipped out the rest of the dough onto an oiled counter and rolled it into a 12 x 18 rectangle with an oiled rolling pin. It was a little sad to hear and see all of the bubbles popping as I rolled it out. I then pressed 1 cup of mozzarella and a meat mixture I had made earlier (1 oz pancetta, 3 oz pepperoni, 1 finely chopped onion, 1 tsp minced garlic, and some chopped green olives for the hubby's half) onto the dough. I rolled it up into a log (starting with the shorter side). and then used my trusty dental floss trick to divide it into twelve rolls. and we let them rest overnight. This afternoon, we took them out of the fridge, let them rest for 90 minutes (they probably could've used a little more time to rise, but we were hungry! ), and then baked them at 325 df for 15 minutes. I spread a spoonful of pizza sauce (same sauce recipe I used for the pizza napoletana) and topped them with shredded cheese (5 oz mozzerela mixed with 3/4 oz parmesan and 1/2 oz asiago). Hubby: "Ouch! Hot! But can't stop! So good!" Little guy (who will be 3 years old on Friday!! ): "Oooohhh, delicious. Pizza buns, I love you sooooooo much!" This is hubby's favorite kind of bread. Whenever we need an easy, fast dinner, we'll pick up a rotisserie chicken and a loaf of bread (or we used to, before I started baking my own). I'd choose a hearty multi-grain, but hubby always goes for an herb and garlic artisan loaf. Peter Reinhart's potato rosemary bread is a two-day affair, although on the first evening, all I had to do was mix up the biga (pre-ferment) and make a small batch of mashed potatoes. I meant to make mashed potatoes for dinner so we could just use the leftovers, but it never happened. Never fear; hubby and I happily ate the rest of the potatoes (that I didn't need to save for the bread) as a late-night snack! Early this afternoon, I mixed everything together. The ingredient list for this bread was a little out of the ordinary: in addition to the biga, bread flour, salt, yeast, and water, I also added freshly ground pepper, mashed potatoes, and chopped fresh rosemary. I started this one in the mixer, but it was still very shaggy after the suggested time, so I flipped it out onto my counter, allowed it to sit (while we put the kids down for nap), and then continued by hand. I found that it took quite a bit more flour and a lot of time to get the dough to 77 degrees and a nice windowpane. But given how busy things have been around here, it was nice to spend some time kneading! And then I flattened out the dough and added . . . roasted garlic! I'd never roasted garlic before, and although I thought I'd bought a head of garlic the last time we were at the store, apparently I hadn't. I quickly jumped online and read various posts about this bread to see what reviews the garlic had received . . . it seemed pretty unanimous that it was a necessary ingredient. So hubby ran out to the store, while I preheated the oven. Luckily (because we had to leave for swimming lessons in about 30 minutes), I found this post from Paul at Yumarama about how to roast garlic more quickly and efficiently. It worked great, the house smelled wonderful, and it was definitely a necessary ingredient to this bread! Anyway, I kneaded in the roasted garlic and then left the dough to double. It doubled very quickly . . . right at an hour, I believe. I divided the dough in two and shaped half into a boule and half into two ounce rolls. An hour later, the dough had doubled again, so I preheated the oven. The rolls cooked for 20 minutes, the boule for 35. The rolls probably should have been taken out a few minutes earlier; the bottoms were at that almost-burnt stage that adds a slightly bitter taste to the bread. The boule, on the other hand, was perfect! I agree with some other BBA Challengers who talked about stepping up the rosemary and garlic next time, but we really enjoyed the bread as-written, too. The bread was soft with a light crust. We ate this with chicken-noodle soup tonight and the garlic rosemary mixed with the thyme and parsley in the broth was an outstanding flavor combination. Peter Reinhart's pizza napoletana recipe makes six pizzas. Last time, I made three (one for me, one for hubby, and one for the kids to share) and froze three. Two days ago, I pulled the frozen dough balls out of the freezer and put them in the fridge to defrost, along with the bag of leftover frozen pizza sauce. I pulled the dough balls out two hours before baking time and flattened them onto a piece of parchment paper. I didn't want the shaping disaster of last time, so I got out three sheets of parchment paper, sprinkled them all with flour, and sprayed them with cooking spray. I cut the parchment paper around each dough circle so I could just flip each one onto the new piece of parchment. I didn't even try to pick them up, much less shape them by tossing them. I just stretched and pulled until each small circle resembled a pizza. Unfortunately we only had enough leftover sauce for about one and a half pizzas, so I cut it with plain tomato sauce. We used the same cheese mixture and same toppings as last time. I used a sheet pan to slide the pizza, parchment paper and all, onto the pizza stone, and I'm happy to report that there were no disasters this time! It was a much less stressful experience, the pizza cooked up just as well (if not better), and all three pizzas were delicious! I would like to try the pain à l'ancienne and the focaccia as pizza dough, but this recipe is definitely a keeper! I was really excited to finally have a one-day bread again (I looked ahead and there's only one more one-dayer! ), but I started it late last night, so I ended up drawing it out to two days after all. Another reason I was excited is that this bread has been getting pretty yummy reviews from other BBA Challengers. This bread starts with a sponge made of bread flour, sugar, yeast, and water, which takes 60 - 90 minutes to foam and rise and "look like it's on the verge of collapse." Mine poufed all the way to the top of the bowl in only 60 minutes. So I mixed everything together: bread flour, sponge, lemon extract, vanilla extract, orange extract, eggs, powdered milk, sugar, salt, and unsalted butter (which I also used in place of the shortening that's called for). I only had to add 1 tbsp of water for the dough to come together. And because I was alone downstairs (the kids were theoretically in bed, although in actuality hubby was playing go-back-to-bed-go-back-to-bed-go-back-to-bed-go-back-to-bed with the little guy), I actually got to knead by hand! The bread was just as described: soft, supple, and very easy to knead. I got a nice windowpane and stuck the dough into my measuring cup to rise. It was supposed to take 2 hours. 2 hours later, after our romantic Valentines dessert/movie were over, the dough had barely moved. So I stuck the whole thing in the fridge and decided to deal with it the next day. 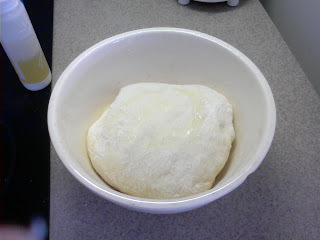 This morning, I pulled the dough out early, and it took a few hours to rise. Then I went to divide it in two, form it into boules, and put it in pie plates. And then I discovered that I only could find one pie plate. So I put 1 lb of the dough into the pie plate. Luckily, I'd read this brilliant idea from a fellow BBA Challenger, so I pulled out my muffin tin and divided the rest of the dough into 1 3/8 ounce mini-boules. I let these rise for about 5 hours. The minis looked great, but it became clear that the larger loaf was never going to fill the pie plate as it was supposed to. So I heated up the oven and baked them: 20 minutes for the minis, 35 minutes for the larger loaf. The smell was heavenly. The result was a soft, fluffy, extremely flavorful bread. Most people have talked about eating this bread with a simple smear of butter. We've always eaten this bread (packaged as Hawaiian bread) with spinach dip or artichoke dip, so I may have to whip some of that up tonight. As a once-a-week French toast household, I will also (of course) have to try that . . . it's on tap for Wednesday night dinner! Well, I caved to peer pressure (from my husband) and whipped up a quick dip. I enjoy hot artichoke dip in basically all of its forms: with spinach, with crab, with cream cheese. This is not the richest or the best version I've ever had, but it was quick, easy, light(ish), and tasty, and I happened to have all of the ingredients on hand. Preheat broiler. Top with 1 tbsp additional cheese and broil for 2 minutes. The sweet of the bread with the salty/savory of the dip was a tasty combination. The artichoke dip also worked well with the last of poolish baguettes. And then, due to a couple of missteps regarding what we were supposed to have for dinner tonight, we ended up making the bigger loaf of sweet bread into French toast. I don't think this was as good as the French toast we made with the Artos, which I still think was the best French toast ever, but it was pretty tasty. I have heard about people who bake all of the time, but have to find a way to fit in their lives too, and so they carry their bread with them wherever they go. I have not been that person, instead baking predominantly on the weekends and scheduling our day around my bread schedule when necessary. I wanted to bake my next bread (I find that I dream about baking bread if it's been too long since my last loaf . . . is that weird?!) and I wanted to do it in time to bring a couple of baguettes to my book club at 2:30. However, our Saturday mornings are very booked: swimming lessons, playing on the indoor park at the elementary school where we take lessons, going out for a bagel lunch (does that seem silly when I could just make my own delicious bagels? but hubby and the kids look forward to Saturday bagel lunch all week! ), and coming home for bathtime and naps. That left me about an hour and a half to make the baguette, which, if you've ever baked a loaf of BBA bread, you know is a total impossibility. Last night, I made my poolish. I actually forgot that the poolish needs three or four hours to become bubbly before being refrigerated overnight, and I didn't start until 7:30, so I mixed up the flour, yeast, and water, and then went to bed at my normal time, setting a timer to wake me up when it was time to stick it in the fridge. Not the best method, but it worked. I also noticed ahead of time that the poolish baguettes only require seven ounces of poolish, so I cut the recipe and only made a third. This morning when the kids woke us up unreasonably early, I pulled the poolish out of the fridge. An hour later, I came down to make our breakfast of steel cut oatmeal, and threw everything into the standmixer: a little whole wheat flour (I tried to sift it, but couldn't get anything to stay in the strainer), bread flour, the poolish, yeast, salt, and water. It kneaded beautifully and achieved a perfect temperature. I stuck it into my giant measuring cup, covered it with plastic wrap, and got ready for swimming lessons. While we swam, it sat in my gym bag in the locker room, and when lessons were over and we went to the indoor park, it had doubled. So sitting with the other parents and watching the kids run around, I pulled it out, kneaded it in my hands for a minute, and stuffed it back into the bowl. By the time we got home after eating bagels, it had doubled again, so I shaped it just before nap time. Hubby couldn't find the razor blade I usually use for slashing, so I made do with a scissors. And instead of doing the hearth baking routine with the steam pan, boiling water, and spritzing the oven walls, I decided to try this technique which I read about on Peter Reinhart's blog. I purchased a cheap roasting pan, spritzed the loaves with water before slashing them, and covered them with the pan for the first ten minutes of baking. I could not believe the oven spring when I removed the pan after the first 10 minutes; incredible! My slashes (gashes? ), however, left a lot to be desired! I brought two loaves to book club, where we ate them with brie and cupcakes. Between the four of us, we demolished one and a half of the loaves. There were a few big holes, but in general, this bread had a pretty tight crumb. The taste and texture were great, very reminiscent of the French bread. Although this was not as good as the pain à l'ancienne, I can definitely see making it again. Some day, it might be nice to bake in a nice, relaxed setting, where I have time to actually devote a full day to bread: make a mise en place, take step-by-step photographs, knead by hand. I'm guessing it may even be possible by this summer when at least I don't need to worry about work. But for now, I'm happy that I still got to bake the next bread in the Challenge, even in the midst of this busy life! BBA #25: Pizza Napoletana . . . just in time for the Super Bowl! I was really looking forward to this bread. For one, we are a big pizza-eating, pizza-loving family. We eat pizza at least once a week. Hubby even has certain categories: frozen pizza, home-made pizza, delivery pizza, restaurant pizza, and take-and-bake pizza. If he's in the mood for one category, another will not suffice. Plus, I was really eager to put the stress of the panettone behind me. Lastly, this recipe seemed to get really good reviews from just about everyone in the BBA Challenge. Maybe some of them can help me figure out what to do to make this process go more smoothly next time (because there will be a next time). and three were rolled in olive oil and then dropped into freezer bags and placed immediately into the freezer for later use. This afternoon, I took them out a couple of hours before we were ready to make them. Nothing changed; were they supposed to grow? Then I put my pizza stone on the bottom of my gas oven, cranked the oven up to 550 degrees, and started cutting up our toppings. Here's where things began to get challenging. Did anyone else have trouble trying to stretch the dough into a circle? I was game to try Peter Reinhart's method: pick up the dough ball carefully, use the back of your well-floured hands to carefully bounce the dough while oh-so-gently stretching it out. The second I tried, the dough tore. Terribly. In a million places. I quickly put it onto my prepared sheet pan, covered in corn meal, and tried to repair the tears while still trying to stretch it out. It was nowhere near uniform. Plus, the smoke alarm started to go off. I had scoured the bottom of my oven, but our smoke detectors just do not like any temperature over about 450 degrees. I was reminded of Anne Marie, who talks about having to call the alarm company to disconnect her smoke alarm whenever she's starting another high-temp BBA recipe. Put 2 tbsp olive oil into a large skillet over medium heat. Sauteed for about 5 minutes. and simmered for about 30 minutes, until thick. Then toppings. Topping the pizza was the best part (especially after the stress of the shaping) because the kids came over to help top their own pizza. And then into the preheated oven. Here were some more problems. I very generously covered my sheet pans with corn meal, but there was no way this pizza was going to slide off nicely onto the pizza stone. Advice?! We used our little pizza peel to scrunch the pizza half off of the pan and onto the stone and then tried to use it to straighten the pizza back out once on the peel. It only sort of worked. Plus, all of the corn meal spilled onto the floor of the oven and immediately started to smoke and burn. The smoke alarms had a field day. And they tasted pretty good. In general, hubbie and I both like thicker, chewier crusts . . . any way to make this recipe bake up a little thicker? We also noticed a lack of wow-factor just because, although I had never been a bread baker before this challenge, I have been baking my own pizza crusts for years. But hubbie still admitted that this was the best pizza crust we've ever made at home, and (given that it is Super Bowl Sunday, which gives us permission to overeat for the day) he did eat his entire pizza in one sitting. Definitely a make-again recipe, but I'll take any advice to make the shaping and baking go more smoothly next time!! Most of the time, we have no leftover BBA bread. And I generally don't halve the recipes the way some other BBA bakers do. See, hubby and the baby love homemade bread, and are generally capable of eating whatever quantity I make. Occasionally either hubby or I will take bread in to work to share, but it's usually not leftover. In fact, hubby often gets a little crabby with me: "Why do they get my bread?!" But right after I baked pain de campagne, hubby got ill. The details are not appropriate for a food blog, but suffice it to say that no more bread was eaten that weekend. It was too early in the weekend for the bread to survive until Monday and still taste as good, and I didn't want to throw it away, so I froze it. I know a lot of people freeze their extra bread and swear by it, but I must be doing something wrong (wrapping thoroughly in saran wrap, then in aluminum foil, then placed in a freezer-safe bag . . .?) because I never think it tastes as good after it thaws as it does when it's fresh. So this time, when I pulled the bread out of the freezer, we sliced it lengthwise (note to self: slice before freezing next time!!!) and then I used it to make garlic bread. Hubby is pretty insistent that this is the best garlic bread ever, and if he ever opens an Italian restaurant (hahaha), this will be the standard. 2. Melt the butter over low-medium heat until foaming. Add the garlic and saute for 5 minutes, stirring occasionally (and watching to make sure it doesn't burn). Stir in the salt and pepper. 3. Use a pastry brush to brush both sides of the bread liberally with the butter mixture. Put two halves back together and wrap in foil. 4. Place on baking sheet and cook for 15 minutes. Unwrap bread and place buttered-side up on cookie sheet; return to oven and bake for 10 more minutes. 1. Heat olive oil in large dutch oven over medium-high heat. Add onion, carrot, celery, garlic, 1/4 tsp salt, and bay leaf to pan. Cook 8 minutes or until vegetables are tender, stirring occasionally. 2. Add turkey, pork, pancetta, and 1/4 tsp salt and cook until ground meat is no longer pink (about 6-8 minutes). 4. Add tomatoes, broth, wine, milk, nutmeg, and rind. Bring to a boil. Reduce heat to a simmer and simmer 45 minutes. 5. Add cinnamon stick and simmer 30 minutes. 6. Meanwhile, cook pasta according to package directions. 7. Discard bay leaf, rind, and cinnamon stick. Stir in remaining 1/2 tsp salt and 1/2 tsp pepper. According to encarta, "bane of existence" means "something that continually causes misery or problems." Yep, that about sums up panettone, BBA Challenge Bread #24, for me. Okay, so it does not fit the actual definition of bane: poison or causing death, but man, this bread sure has been challenging for me! Anyway, I finally got my starter to a place where I thought I could proceed with the "barm" Peter Reinhart calls for in the panettone. So last night, I mixed the starter with a little warm milk and some flour. It took a long, long time to start to get bubbly, but given how cold it is here, I guess that's not really a surprise. Last night, I also soaked some dried fruit (apricots, apples, and cherries) in some whiskey and vanilla and lemon extracts. Not a lot of thought went into any of these ingredients; they were just the only things we had in the house out of the choices Peter Reinhart gives us. After reading a couple of so-so reviews of panettone from other BBAers, plus knowing that hubby and I don't really enjoy breads with fruits (see cranberry-walnut celebration bread and cinnamon-raisin-walnut bread, both of which made it into the "will not make again" category), I decided to make a half recipe. Today, after work, I mixed the barm, the rest of the flour, the salt, the sugar, the yeast, and the minimum amount of water, and let them have a longish autolyse while I put the kiddos to bed. Then I added the butter (which I'd forgotten to soften) and the liquored-up fruit and tried to knead with my mixer. Ha ha. And then tried to knead by hand. Ha ha. And then added a bunch of flour. And then a bunch more. And then a bunch more. And then plopped back into the stand mixer and added a bunch more flour. And then thought, "Why in the world would he have us add so much water when there's also liquid in the fruit/alcohol mixture?!" I reviewed the recipe in my head, and then checked back in the book. Sure enough, I had halved everything except the water. Even with using what I thought was the minimum amount (2 oz), it was still .5 oz more than if I'd used the maximum amount and had actually halved the recipe (1.5 oz). I am so bummed. Weeks of waiting to get to this bread so I could move on to pizza napoletana and Portuguese sweet bread and all of these breads that I am so excited to try. Weeks of stressing over my starter so I could make this. Days of getting everything ready. Argh! Then (of course) I realized that I didn't have a 6 inch pan. Or any pans resembling 6 inch pans. I have an 8 1/2 inch pan. And a 9 inch pan. And a couple of 4 1/2 and 5 inch dishes. But no 6 inch anything. And no panettone papers. So I went the muffin cup route (about 2.25 oz in each) with muffin liners (for no other reason than that my muffin tin is hard to clean when you don't use them and really, who wanted to put in extra effort at this point?!) and put the leftover 7 oz in a small baking dish with a parchment collar. The dough was still incredibly sticky as I started to form my mini-boules, although after sitting for about 3 or 4 minutes, it felt much more normal. Anyway, now it's late at night, so the pans are going into the fridge and tomorrow, we will see what we can see! Oh! And both of my cameras were out of batteries when I went to take pictures of the panettone process . . . coincidence?? Baked my mini-panettone this morning: 25 minutes for the muffins and 35 minutes for the small baking dish to achieve the desired temperature. It is a little disconcerting to eat bread out of a muffin paper; you expect it to have the sweetness and airy/crumbly texture of a quick bread. So how did they taste? Meh. So-so. Luckily I can tell that even if I had made them without all of the mishaps, this is just not my kind of bread. So we'll set panettone aside and move on to pizza! Hurrah! **UPDATE: Although clearly not my family's style of bread (my kids and I ate about half of one muffin this morning), these completely disappeared at my lunch table! One person called them "delicious" and a couple people asked if they could have seconds. So I guess they weren't too bad!